Daily use of a sunscreen is essential. Enriched with potent antioxidants, this SPF 30 moisturiser protects skin from sun damage and helps prevent early signs of ageing. Quick and easy to use, the shine-free formula feels so light, you’ll barely know you have it on. Use every morning after washing your face and applying PC4Men Soothe + Smooth. Apply liberally to face and neck. Allergic to aspirin (acetylsalicylate)? Do not use this product as it contains salicylate derivatives (incl. Homosalate). I have sensitive dry skin and this sunscreen, regardless that it is intended for oily/combo skin, is the perfect finish before you go out. Excellent coverage, mat finish, no skin reaction. I honestly didn't know what to think when I first applied it. It stung a bit for the first few uses (I suppose I just had to get used to the chemical sunscreen), and was horrified by the extremely shiny finish after applying it. HOWEVER, if you let it sit for about 15 minutes it becomes matte. A personal trick (if you want it completely invisible), is to wait for it to become matte, and then tap/blot your face with some tissue. PERFECT. I tried this product, sadly it made me break out really badly after a few days of use. Customer service was very helpful though when I told them about this and offered me another sunscreen free of charge.I do not have a lot of experience with using sunscreens on my face day-to-day, so maybe it's because this is a so called "chemical" sunscreen that it made me break out. Anyway this sunscreen has a lot going for it. It doesn't smell and has a very nice and very lightweight feel on skin. Leaves your skin with a bit of a glow but it's still nice and matte. This product really works as described - thank you Paula! It was easy to apply ... my skin felt as I hadn't applied anything and smooth ... didn't smell and didn't leave my face filled with fragrance ... my skin breakouts are almost disappeared ... plus it works as a sun protector. Will definitely recommend this product (if you usually don't like sunscreens at least do yourself a favor and try a sample). Do I need to use this product at night? No, because sun protection isn’t needed at night. Finish your evening skincare routine with PC4Men Nighttime Repair and you’ll wake up to stronger, younger-looking skin. 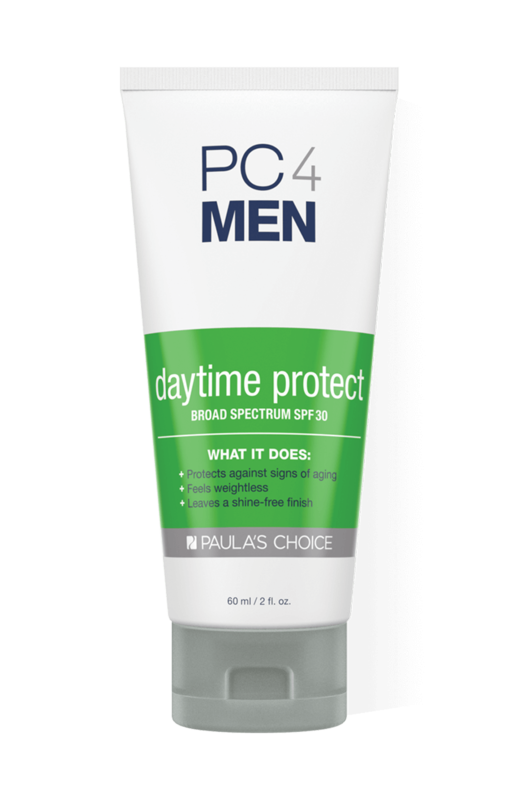 Is there another Paula's Choice product similar to the PC4Men Daytime Protect SPF 30? Our PC4Men Daytime Protect SPF 30 is actually identical to our Skin Balancing Ultra-Sheer Daily Defense SPF 30.